Lionsgate and CoverGirl have just announced that they are official cosmetic partners for Catching Fire. This will included a new makeup line called "Capitol Cosmetics", along with an ad campaign promotion. 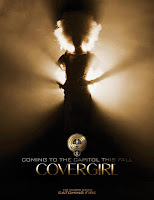 It also appears that CoverGirl products were used during production of the Catching Fire movie! There will be a launch event at the Cannes Film Festival tomorrow (Saturday 18th May), with the full release coming sometime in the fall. HUNT VALLEY, MD, May 17, 2013 — Today, COVERGIRL announced its first-ever major movie sponsorship of Lionsgate’s highly anticipated The Hunger Games: Catching Fire, scheduled for release in North American theaters on November 22, 2013. COVERGIRL will launch a first-of-its-kind creative advertising campaign inspired by the film, featuring new products from the brand’s upcoming Capitol Collection from The Hunger Games: Catching Fire, to be announced at a later date. Jennifer Lawrence, Liam Hemsworth, and Josh Hutcherson lead an all-star cast in the second installment of The Hunger Games franchise, The Hunger Games: Catching Fire. The trailer, which debuted last month, has been viewed over 25 million times on YouTube. The film promises to illustrate the exquisite splendor in the world of the Capitol in rich detail, and the film’s makeup department used COVERGIRL products on set to create the film’s luxurious, high couture looks. Over the past year, COVERGIRL has stood out in the beauty category with its addition of several new spokeswomen, including P!NK, Janelle Monáe and NERVO, who, along with the brand, embrace beauty with a sense of authentic individuality and fearlessness. COVERGIRL’s partnership with The Hunger Games: Catching Fire is the latest expression of the brand’s passion and commitment to continue to break barriers in beauty. Lionsgate and COVERGIRL will be celebrating the movie partnership at a Cannes Film Festival Gala on Saturday, May 18th. Further news updates on this partnership will be released via facebook.com/covergirl, as well as on Twitter at twitter.com/covergirl and Instagram at instagram.com/covergirlofficial.